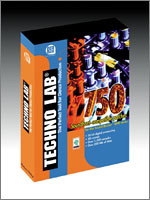 Techno Lab is the first, complete library of professional sounds created for dance music production. This explosive collection, which includes over 750 SoundFont-compatible patches, when used along with your Live! and Audigy series sound card, will redefine the potential of your computer-based, dance-oriented, home recording studio. These truly high-fidelity samples, created using 20-bit technology, will let you compete with the pros. The vast range and variety of patches are all perfect for dance music, so you won't need anything else to create the perfect sound. Techno Lab has been successfully tested with Creative Labs' Sound Blaster Awe series, Live! series, Audigy series, SpeedSoft Virtual Sampler, BitHeadz Unity series, SeerSystems Reality and SurReal, Steinberg Halion, Live Synth, CreamWare PowerSampler , Sound Burst Sample Farm series and Tascam GigaSampler series. Listen to these MP3 files created using only sounds from Techno Lab. We used Steinberg Cubasis as the sequencer, but you can use the sequencer of your choice… it's the Sound Burst patches that make the difference! Download these free SoundFont-compatible patches. You'll hear the quantum difference the Sound Burst SoundFont -compatible patches make!